Constructional difficulty: Easy to moderate in 1U format, more difficult in 2U format. The suggested front panel design for the 2U version of the Journeyman VCF. If our Transistor Superladder and SVF are well behaved perfect sounding filters, then this one is the rude boy of filter design. Its completely unlinear response and discrete circuitry gives it a unique sound of its own. Partially modelled after a classic Japanese filter design from the mid to late 1970s, the Journeyman can be configured in either -6dB/octave high pass or -12dB/octave low pass modes by the flicking of a switch. When two of these VCFs are used together, one in HP and the other in LP, then the effect is astounding. For the 2U design three audio inputs are provided each with its own attenuator. Three CVs can control the cut-off of the filter. One is fixed at approximately 1V/octave, the other two have input attenuators. CV2 features a reversible type attenuator with inverting/non-inverting properties. Issue 2 of the Journeyman is a significant update to the original issue 1 design with, amongst other things, improvements to setting up, less CV breakthrough and better power supply noise rejection. The module accommodates either our standard Oakley/MOTM power header or a Synthesizers.com power header. Current consumption is approximately 20mA per rail. The issue 2.1 PCB is 79 mm (deep) x 143 mm (height). 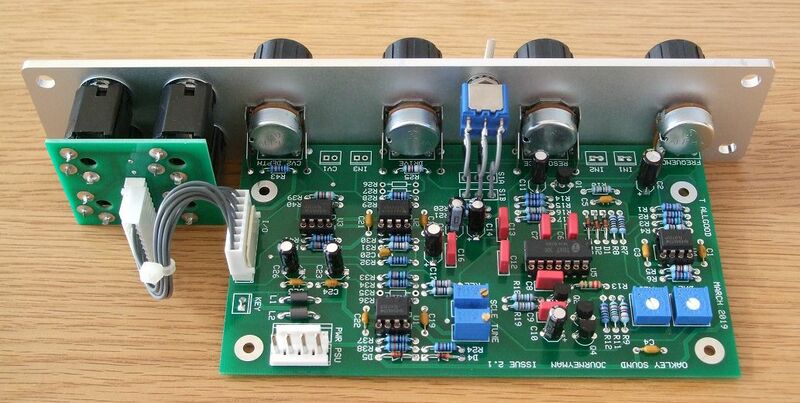 The frequency, resonance, drive and CV depth pots are normally board mounted for easier construction. As with all Oakley projects the PCB is double sided with through plated holes, has tough solder mask both sides, and has bold component legending for ease of construction. The 1U format 'filter core' Journeyman filter. This offers the basic filter module without the extra CV and audio mixing that the full width 2U module provides. All the following samples recorded with a small Oakley set up comprising of one VCO, one VC-LFO, one Journeyman filter, two ADSR/VCA and one midiDAC to control them all. Using the low pass output. Simple sequence with an input from the sawtooth output of a single Oakley VCO. The filter is manually being swept via the 'freq', 'resonance' pots and altering ADSR sweep depth. This time using the high pass output using the same simple sequence whilst the cut-off, sweep depth and resonance controls are tweaked. Various one shot hits and blats at different settings of frequency, resonance and drive. Low pass output; a bit of resonance, fixed cut-off frequency and a bit of reverb for ambience. The Journeyman 'Filter Core' VCF as a single width MOTM format module in a natural finish Schaeffer panel. Note also the use of the optional Sock4 socket board to help keep the wiring to the sockets neat and tidy . The various empty resistor and header locations you can see are used in the 2U wide full version. Journeyman ready made modules may be available from Krisp1.com. Links to schematics are available to purchasers of the PCB or module and will be sent via e-mail when the board(s) are shipped. Last revised: April 15, 2019.